LA's Draft Bike Plan is a huge document of thin ambition, relying on controversy over process to distract from the fact that it lacks vision, it lacks substance, and it lacks the teeth necessary to bring about any change. The Draft Bike Plan was released last week, an hour before the end of the day on the eve of furlough Friday, giving city staff the opportunity to "drop and run" and providing a three-day cooling off period before they had to answer for the long overdue, hotly contested and controversial document. Commissioned in December of 2007, the Bike Plan is part of LA's Transportation Plan which is an element of the city's General Plan. As the consultants so eloquently explained during the community workshops during March of 2008 that kicked off the Bike Plan process, the Bike Plan is a critical funding document that must be updated in order to qualify for funding. As for positioning it as a powerful visionary document with implementation teeth, city staff has never expressed such ambition. The limited opportunity for robust community involvement at the onset, the long, dark and silent period of time when the plan went overdue, the release of Bike Plan maps that positioned "infeasible" as a standard for the future of LA bikeways and the promise of another limited public access comment period have all fueled great gnashing of teeth and provided great fodder for the blogs. Now that the Draft Bike Plan has been released we can evaluate it and I contend that it fails on three levels, based on content, based on process, and based on commitment. Missing from the Draft Bike Plan is the Cyclists' Bill of Rights, a vision document that has picked up endorsement from neighborhood councils and community groups throughout Los Angeles, working its way to the City's Transportation Committee where staff was directed to include it in the city's Bike Plan. It is missing. In its place is a plaintive whimper of a vision that simply asks for consideration. At the Federal and State levels, Equality is positioned as the foundation of mobility planning but here in Los Angeles, cyclists can look forward to a future based on "consideration." Long Beach, by way of comparison, has a Bike Plan that opens boldly by stating that the City of Long Beach "Consider every street in Long Beach as a street that bicyclists will use." It continues by establishing a policy to integrate its bikeways facilities with surrounding communities, a significant commitment given the fact that LA County cyclists have 88 municipalities to traverse and synchronicity is important if cycling is to be a viable transportation choice. From the missing Cyclists' Bill of Rights to the boiler-plate data and specs, the Bike Plan not only misses the big picture but it also fails to establish itself as the authoritative document that could be used to settle some of the minor Bikeways controversies that have arisen of late in Los Angeles. The Draft Bike Plan does demonstrate a bit of creativity, unfortunately it's creative accounting. By using the collective term "Bikeways" which includes Bike Paths, Bike Lanes, Bike Routes, Bike-Friendly and Good Wishes, the Draft Bike Plan can claim a significant improvement over the old plan. But apples to apples, LA's old Bike Plan had 452 miles of existing and proposed Bike Paths and Bike Lanes. The Draft Bike Plan now has 400 miles of existing and proposed Bike Paths and Bike Lanes. That's a decrease. Adding Bike Routes and Bike-Friendly streets to the mix is bad math and engineers should know better. 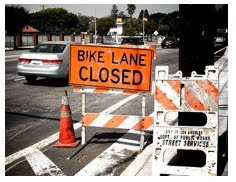 The simple fact is, LA slid backward and Topanga Canyon Boulevard was designated for bike lanes on the old plan, the engineering and funding was in place and the LADOT rejected it, electing to downgrade it to "infeasible" and finally "possible" but in reality "never." From the vision to the details, LA's Draft Bike Plan is hundreds of pages of very pretty, shelf-ready Bike Plan, destined to collect dust. The Draft Bike Plan’s short comment period prevents Neighborhood Council involvement, simply by shortcutting a process that essentially requires a full month cycle for committee meetings and then a full month cycle for Board Meetings, simply to offer feedback. The cavalier manner in which the 89 Neighborhood Councils are dismissed from the process speaks volumes. As if often the case, staff cry budget blues when explaining why the community meetings are limited but then fail to take advantage of Neighborhood Council regional meetings such as the NC Action Summit, the NC Congress, NECA, the Valley Alliance, the Westside Alliance, the Harbor Alliance, the South LA alliance, LANCC, the Citywide Alliance and PlanCheckNC. It’s not hard for city staff to find the public, if they’re really sincere about finding us. The hard charge is simple, do they really want the public involved? Through it all, it should be noted that the LADOT is in the process of developing a Memorandum of Understanding (MOU) with the Neighborhood Councils in which 60 days is the minimum period of time for comment on small projects and the amount of time increases with the significance of the proposal or plan. It is telling that the Draft Bike Plan is given less than the minimum time, giving it less significance than simple neighborhood improvements or variances. The Draft Bike Plan refers to "respect and consideration" as the essence of the vision and it is imperative that the City of Los Angeles bring those words to life now, not down the road after the Draft Bike Plan has gone through the process. The value of LA's Draft Bike Plan is in its ultimate impact on the streets of Los Angeles but we have little hope that real change will occur and, in fact, we have evidence that it is a document with no teeth carrying little commitment from even its departments of origin. All the talk of bikeways amenities, support for cyclists, steps taken by the city to encourage cycling as a viable transportation choice are contradicted by the simple fact that nobody from City Planning of the Department of Transportation found the courage to simply cross the street to offer some advise to the LAPD on the positioning of their bike racks at the new Police Headquarters. Granted, one would think that the LAPD would be familiar with Crime Prevention Through Environmental Design (CPTED) but such is not the case. The bike racks are as far from the front entrance as possible, around the corner and behind a wall, in an area that offers refuge to someone who would want to hide and wait for a victim. LA's Bike Plan has long given the LADOT the responsibility to communicate to the city departments simple bike parking standards. To this day the Library Department, the Fire Department, City Hall, Rec and Parks, and the 45 City Departments that compete with each other for autonomy can't agree on how to position a bike rack if they even have bike racks. This does not speak well for the Draft Bike Plan's ability to serve as the platform that will bring together the dozen departments that have a piece of the street that the cyclists of Los Angeles, hereafter known as transportation solutions, must navigate in order to get home safely at the end of the day. Conclusion: LA's Draft Bike Plan is thin on content of substance, is the product of an ongoing flawed process, and avoids at all turns any attempt to position itself as a document of change with a real plan for implementation. It is an exercise in civic enragement designed to qualify the City of Los Angeles for Bikeways funding that will then simply fall into the co-mingled coffers of the LADOT, a department that has failed to establish or support cycling as a viable transportation choice in the City of Los Angeles.